It's June and my first week of summer break! Woo hoo! I'm enjoying not having to set an alarm, pack lunches, and all that comes with the school year. Though sleeping in with two children of my own is not really an option. :) We are taking it easy this first week before our summer activities begin. It's time to link up with Farley's Currently. Listening: It's baseball season...if they're playing, the Giants game is always on! Loving: I woke up this morning to find that I had hit 500 Instagram followers! So to celebrate, I'm throwing a little giveaway. You can enter here. Wanting: If only we didn't live in one of the most expensive cities in the country. Then maybe they would stay. I'm going to have to get going on building my TPT store to earn money to fly out and see them, like a lot! Needing: My house typically falls to pieces during the school year. It's just too much to keep up on it all. So, the summer is the time to clean out, organize, and put it back together. If I do it now, I can enjoy the rest of the time off! 1) The mister and I will celebrate our 10 year anniversary in July. Love that man! 2) I love getting to spend the summer time with my own 2 girls. Quality time at its best! 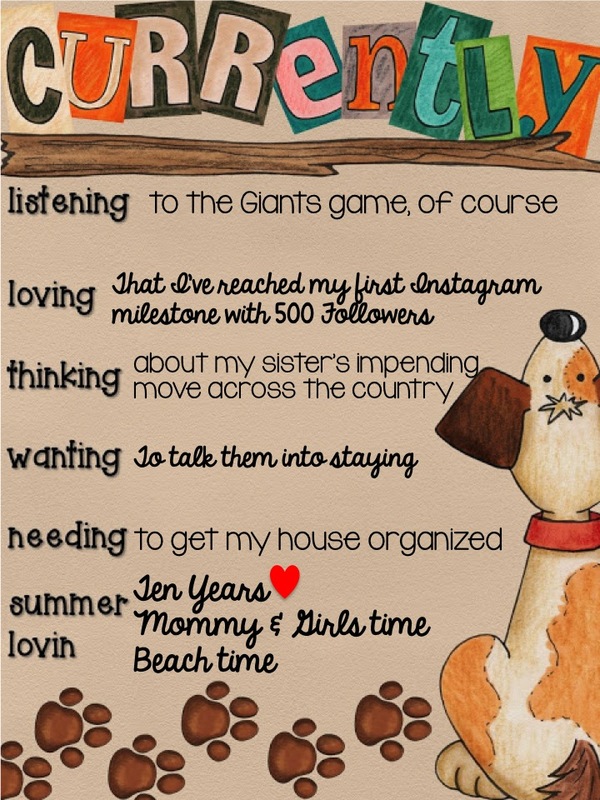 3) I'm really looking forward to our time at the beach as a family later this summer. 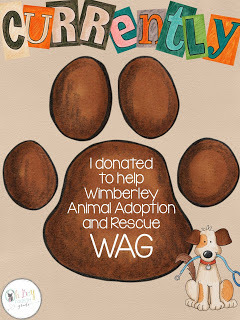 This month, Farley is also collecting donations for WAG in Wimberely, TX. This sweet little town has been hit hard. You can head over to her blog to donate, too. I too love your blog design… Orange is my FAVE!!! Cute blog and congrats on hitting 500 Instagram followers. IG is my favorite social media outlet...constant virtual PD at its finest! Enjoy your summer! Congrats on 500 followers! That is so exciting. Also, congrats on your upcoming ten year anniversary! I am sorry to hear your sister is moving, that must be so hard. Luckily, with technology it is a little easier to stay connected with face time and Skype, but I know that is not the same. I just know that you will be successful in your TpT store and before you know you will be flying out to see them all the time! :) Have a great day! Congrats on your Instagram milestone!! I am still not on there yet (I guess I am just a little scared of it!). I am excited about spending time with my little girl too! She is 2 and full of energy! She makes every day so much fun. I am also looking forward to our family vacation together. Have a great summer!! Congrats on reaching 500 followers on instagram! What an amazing accomplishment!